Hendre Mynach Touring Caravan & Camping Park is an award winning site, delightfully situated between the coast road and the sea, a pleasant 20 minute walk along the promenade to the seaside town of Barmouth, on the Mawddach Estuary.We have all the facilities you would expect from a premier site with 2 modern shower blocks, one with disabled facilities. Hendre Mynach is ideal for both couples and families, who are especially welcome during the school holidays. We have special offers for couples out of peak season, please telephone or email for details. By car: Hendre Mynach is located 1/2 mile north of Barmouth on the A496 Harlech road. Barmouth is only 2-3 hours drive from the Midlands and Liverpool area, and major roads link this delightful little seaside town from the A55 and M56 in the north on to the A494; the M6 and M54 from the Midlands and A470 from the south. 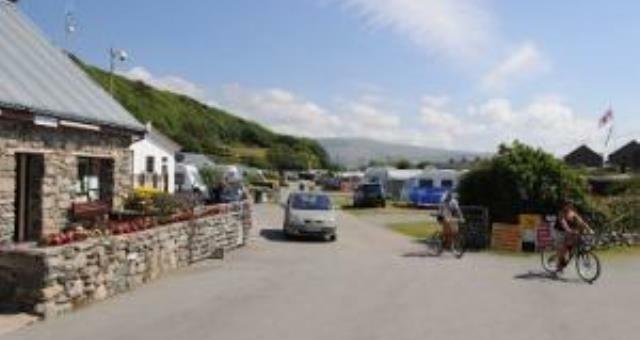 Hendre Mynach Caravan Park can be found ¾ mile north of Barmouth along the A496. Note that you can’t reach us by car by driving along the promenade. (You can only cross the railway line by foot/bicycle/motorised scooter). By train: From Barmouth Station, walk along the promenade for about 25 minutes and cross the railway to the site by skate park on the public footpath. Access the site by the gate. Please check in at reception before setting up your tent. By coach: National Express provides connections to the area. 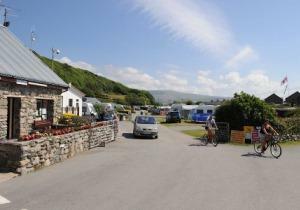 Local transport: The number 38 bus along the coast road to Harlech and beyond is nearby, by the main entrance to the caravan park. From Barmouth, there are buses available to Dolgellau and Tywyn and back to Hendre Mynach. From the railway station in the centre of Barmouth the trains run up the coast as far as Pwllheli and down the coast as far as Aberystwyth, both routes with wonderful scenery and plenty of small villages and towns on the way.